In 2006 in Guyana and 2007 in St Kitts, Steven Jacobs showed leadership ability by Captaining Guyana to consecutive Regional U-19 three-day cricket titles before leading the West Indies U-19 team in the 2008 Regional 50-over tournament as they prepared for the 2008 U-19 World Cup in Malaysia in which India’s Virat Kholi participated. 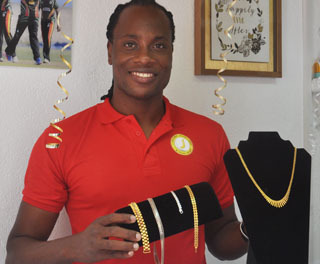 Now, 12 years later and with five First-Class fifties and 54 wickets to his name and a Diploma in Sports Management in 2014 from UWI, the 30-year-old Jacobs officially entered the world of Entrepreneurship yesterday by launching the Jacobs Jewellery and Pawn Shop located at 16 Pike Street Kitty. Jacobs, who played the first of 26 First-Class matches against the Windwards in Grenada in 2006 as an opening batsman, married his wife Simone last September and is the Father of a boy (Jordon) and a girl (Jamie-Lee). “Becoming a Father has given a new sense of responsibility and made me realise that there is life after cricket which inspired me to this Jewellery and Pawn Shop (today) yesterday,” Jacobs explained. Guyana off-spinning all rounder Steven Jacobs yesterday launched the Jacobs Jewellery & Pawn Shop in Pike Street Kitty. “I grew up around Gold since was Father was the owner of King-of-King Establishment which he owned from 1996 to 2014 so I wanted to carry the Jacobs tradition but with my own style. Jacobs who resides in Herstelling, East Bank, informed that he wanted the Kitty location because this was where the King-of-Kings was and was a popular Jewellery shop in Pike Street. Because of his popularity as a National Cricketer, Jacobs, who represented the Jamaica Tallawahs in this year’s CPL, already has a good clientele for his business which opens from 9-5 from Monday to Saturday. “I always wanted to be involved in business and did this behind the scene. I have made stuff for a lot of the cricketers like Emrit, Carlos Braithwaite, Santokie and Sunil Narine and others and we have a lot of orders coming in,” informed Jacobs who has also played 38 List ‘A’ and 43 T20s. The Malteenoes off-spinner said his Jewellery can be ordered and made to the customer’s design or choose from a catalogue book or you can buy on-line or just walk in get what you want at very affordable prices. Jacobs, who represented Guyana, Guyana Amazon Warriors, Jamaica Tallawahs, Vancouver Knights and West Indies Under-19s, says he will place equal focus on his cricket and Business and wants to get this bigger in the future, adding this is a small step in the bigger picture. “This is also a way of supporting the local business industry since many have supported my cricket career and I want to give back to society. I have employed four persons and this Jewellery shop will be open even when I am away for Cricket,” explained Jacobs. Jacobs Jewellery and Pawn shop will collaborate on December 23 with the Sophia ‘U’ empowerment trust to provide Christmas gifts to the less fortunate children in the Sophia area at a Party for them. Outside of cricket, Steven also runs Jacobs entertainment which promotes the annual CLP party where several artiest including DJ Bravo performs. It is good to see players like the former St Joseph High Student investing the money they earn from cricket into business ventures and donations to less fortunate in society. His establishment can be contacted on 227-8748 and 622-4970 or at [email protected], while their Facebook page is Jacobs Jewellery and Pawn Shop.